Any turf spray treatment, for nutrition, disease control or growth regulation, is only ever as good as the accuracy with which it is applied. 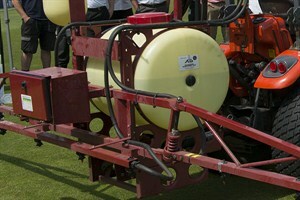 Sprayer set up is the first stage in hitting the intended target and achieving desired consistent coverage. 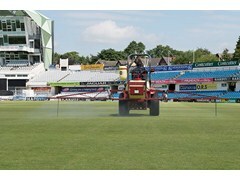 Visitors to this year's PitchFocus event, held at the Headingley Stadium in Leeds, were given a first-hand demonstration in sprayer set-up and checks to help achieve consistent and accurate application. Syngenta Application Specialist, Tom Robinson (right), explains what to look for and what steps to take before the sprayer gets out on the pitch or golf course. Firstly, undertake a good visual check all round the sprayer. Make sure nothing has been bent or broken whilst it has been stored in the shed; it is certainly not unheard of for nozzle units to have been bent or broken off. If then machine is dirty or dusty, give it a wash off prior to checking its condition. Washing should ideally be in a designated filling area and any run off collected for safe disposal, in case there were any spray residues on the outside of the tank. Otherwise, wash on a safe area of ground where washings will not run into a water course or drainage ditch. With a clean machine, make a close inspection of all the hoses for signs of wear, paying particular attention to where booms have folded over and may have rubbed or pinched a hose during transit. In worst case situations, the rubber coating could have worn through to expose the sheath, which is a must to be urgently replaced to avoid a potentially catastrophic burst. It is worth checking that when the booms are folded, that no hoses are under tension, which could put extra strain on connection clips and lead to leaks. 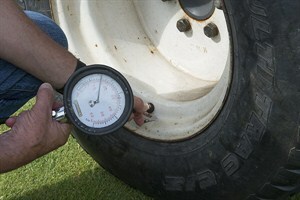 The next step is to check that the tyre pressures are correct and even. Ideally the pressure wants to be operating as low as the tyre manufacturer permits for the weight of sprayer being carried (when full). Most importantly, the pressure must be exactly equal on each side, especially the rear tyres. This can make a really significant impact on achieving a level boom. 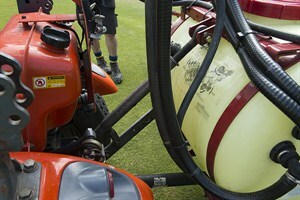 Having established the sprayer looks in good condition, park on a flat surface and open out the booms. Looking from the side of the tractor, and with the central nozzles at 50cm height from the ground, check that the sprayer is vertical. If a sprayer is tilted backwards it will put more spray on the front of the leaf, in the direction of travel, or vice-versa if leaning forward. 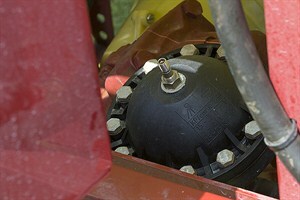 Adjust the tractor top-link to put the sprayer in the right position. If the sprayer is mounted on a Gator or ATV carrier machine, the mounting frame may require adjustment. Now check that the boom is absolutely level all the way across. In too many instance we see 'droopy boom syndrome' - where one or both boom sections drops at the end. This may require mechanical adjustment or refurbishment of bushes and suspension systems to correct, but is essential to get an even spray pattern. When the boom is straight, measure from the ground to the tip of the nozzle on the far left unit, and repeat on the far right - it should be an identical 50cm. If there is any difference, adjust the link arm height to correct. Even just one-quarter turn on the link can make several cm's difference at the boom end. Whilst doing this, just confirm that the distance being measured is the ground to nozzle tip, not the actual boom height. In practice the nozzles can sit up to 10cm or more below the boom height. Whilst the Syngenta XC Nozzle has been designed to cope effectively with undulations and variability in height whilst maintaining an even spray coverage, the best results are still achieved from accurately setting up at the optimum 50cm height. Make these checks with the tractor running and the hydraulic system powered-up, otherwise when it is switched off the sprayer tends to sink and would give an incorrect measurement compared to when working. Now we need to look at the operation of the sprayer. Fill the tank at least half full with clean water and, in the designated sprayer-testing or cleaning area, switch on the nozzles and high pressure test to at least five bar output. Visually check all the hoses and joints for any signs of leaks. Reduce the pressure to a normal operating level of three bar and watch the pressure gauge. If the needle is fluttering, the most likely cause is that the pressure regulating chamber (identified by having a bicycle Schrader valve on the top and usually situated by the pump), does not have sufficient air to equalise the sprayer. To rectify this, take off the valve cap and using a bicycle or car-tyre pump, put in the same pressure that you would be working at - typically three bar. The needle on the gauge should now remain steady. If not, there may be another mechanical fault that needs addressing by an engineer. Then, whilst still looking at the gauge, switch off different sections of the boom to check that the pressure remains consistent at all times. If it goes up when one section is switched off, for example, that means the remaining sections will be applying more spray and give an inaccurate result. 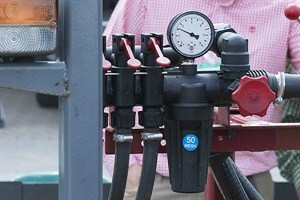 The pressure can usually be regulated and balanced by adjusting the rotating caps on the back of the section isolating valves. Turning our attention to the nozzles, with the sprayer switched on check that the pattern from each nozzle looks even and consistent. Small particles of grit can give a streaky effect to the pattern. Flat fan nozzles are notoriously susceptible to these partial or full blockages, where the shape of the orifice gives narrow pinch points that can collect debris. The Syngenta XC Nozzle, however, has been designed with a more open orifice that means that any blockages are extremely rare, especially with the 04 or 08 sizes. Also, take the nozzles out and visually check any filter that is in place. Where iron or trace elements have been regularly sprayed, as is frequently the case on sports turf, fine filters can be blocked with residues that interrupt even flow. Poorly formulated liquid fertilisers can also prove problematic. 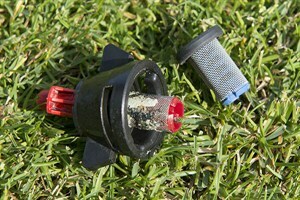 The Syngenta XC Nozzle design facilitates the use of a larger 50 mesh wire filter (usually identified with a red plastic insert), compared to the finer 100 mesh (blue insert) filter typically fitted with standard turf sprayer nozzles. I do suggest to always fit wire gauze filters, which are far more effective than the predominantly solid metal filters with slots that are sometimes used. Then, we need to do a test to check for nozzle wear, which I advocate is a good routine every two to three months, or if you suspect there has been any change in the area you normally expect to cover from a fill. I am often asked how long a set of nozzles should last, but it is entirely dependent on how much spraying is done, and more to the point what has been applied. Syngenta fungicides or Primo Maxx, for example, are formulated with fine particles for fast turf uptake and so create very limited nozzle wear, whereas a generic coarse soluble iron could cause far greater abrasion and rapid wear. Once the shape of the orifice has been distorted, any wear can be exacerbated and can rapidly deteriorate. New Syngenta XC Nozzles are precision manufactured from modern hard wearing polymers to optimise their working life. To do the test, set the sprayer to working pressure, and then use a measuring cylinder to collect the output from an individual nozzle for exactly 30-seconds. Note down the volume and repeat for each nozzle. Calculate the average output per nozzle, and then look to see if any individual nozzle was more than 5% different to the average. If it was, then the nozzles would be unacceptably worn and the whole set must be replaced. This pre-spraying routine should typically take no more than 15 minutes, or possibly 30 if doing the nozzle wear test too. 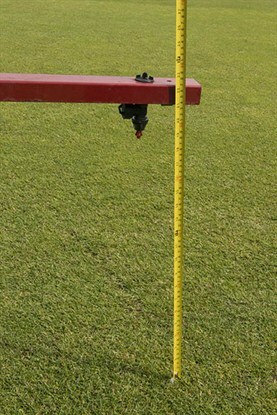 Given the value of the products usually being applied, and more importantly the opportunity to optimise their performance and results in enhancing turf quality and consistency, it is a simple step to improve the accuracy of every application. 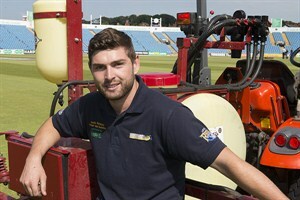 Lewis Pattinson, Leeds Rugby Assistant Head Groundsman and sprayer operator for the PitchFocus event, welcomed the chance to glean Tom's experience to set up his Hardi tractor mounted sprayer, including fitting the new Syngenta XC Nozzles. "It really highlighted that spending just a few minutes checking the sprayer before any application can make a real difference in the accuracy of results - and hopefully ensure that we get the very best from every treatment," he reported. "We are aiming to be far more precise with the Everris-led nutrition programme, including liquid feeds to keep the turf in good health through the extended playing season, but avoid wasteful over-application; accurate spraying is crucial to get that right. "With timeliness also important for proactive disease control applications and Primo Maxx programmes, the tips we have learned from the sprayer set-up session will certainly further help. "Having seen it in practice, it is not that difficult and something that we can beneficially build into the routine." 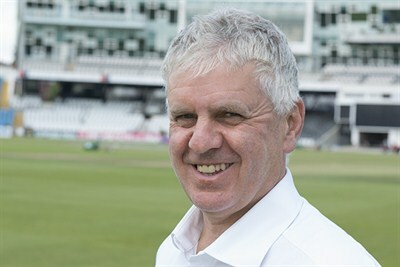 PitchFocus was organised by Everris and Syngenta at the Leeds Headingley Stadium, in association with Bernhard Grinders; Campey Turf Care Systems; EnvironMonitors and Lely/Toro. With special thanks to Leeds Rigby Head Groundsman, Ryan Golding and Headingley Cricket Head Groundsman, Andy Fogarty.